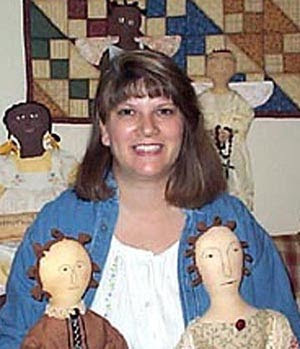 Jackie Hendricks of Plain-n-Simple makes wonderful Izannah inspired dolls. I was lucky enough to purchase one of her dolls last year. When I (Dixie) opened the box I was amazed at how Izannah-like the doll's head was. I've seen quite a few original Izannah Walker dolls and Jackie has really caught the feeling of the originals in her sculpting and painting. Recently Jackie tested my Izannah Walker pattern and the doll above is the result. Jackie's work is inspiring to me. On to the questions! JH: I have been making dolls since 2000, I didn't sell my first ones as they actually had my daughters hair on them. How did you begin selling your work? 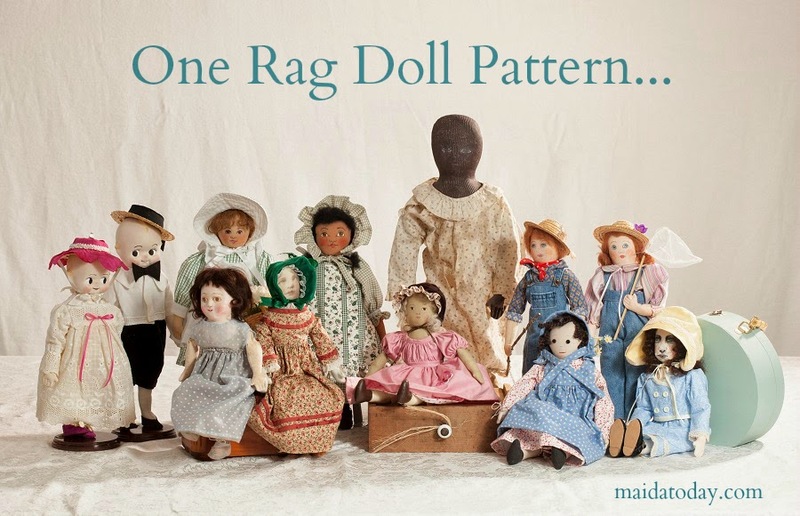 What was the first doll you made with the intention to sell? 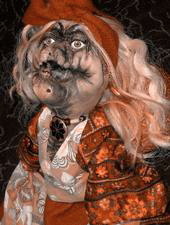 JH: This doll was an old madame gypsy and she was full of color and spice and everything not nice. I saw other doll makers selling on Ebay, and thought, I'm going top give it a whirl! I began on Ebay, and sold a few at a local antique craft shop. JH: Yes, I was a dollie girl. I remember my first attempt at making doll clothes(cutting up wash clothes and aprons of my moms, simple stuff like 2 arm holes and belt and i made a coat), so when my daughters started doing this, I guess I wasnt too shocked, until they 'snuck' into my antique fabric stash. JH: I had an unusual child hood, my mother would take us to this 1904 dump site and we built 'forts' out of old rusty car doors and the likes. We made baby cribs out of old metal railing and child mattress springs, all rusty and dangerous of course. We found a burnt doll and there she laid in the crib. There were 6 kids in my family, and none of us ever had to get a tetanus shot! My mother once told us all, that if we collected enough pottery with gold leaf on, that we could actually scrape it of, and we'd be 'RICH", i know now, that this was a ploy to keep us occupied, and it worked, but back then, our eyes were huge with hope, and filled wonder. You should have seen the pile of pottery!!!!! All you see of us were our green eyes and our teeth , we were all covered in soot. We worked so hard! JH: I have been contemplating giving up making dolls...Nah Just kidding! I'd never be able too, in a life time!!!!! My work has changed immensely, I dont just cut 2 holes and apply a belt anymore...Hehe. I realized i needed to take more time ( I am as slow as molasses, already) to create a doll not just slap one together to sell on ebay. Realizing the process to make something beautiful is not quick. JH: As of now, I create at my dinning table, because i want to make sure my daughters always have a room to come back to, if need be. 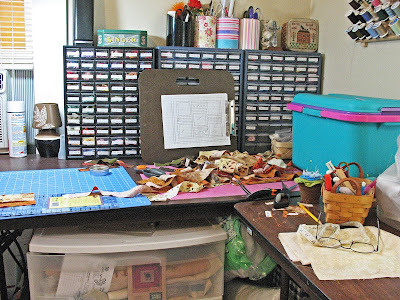 I do want to fill all my creative stuff in the spare room, but...I dont, i know you mothers out there understand. JH: I use my The DOLL red fuzzy Fox book, I don't plan anything, the doll just comes to life. JH: For inspiration, all it takes is a few yards of good old fabric, although i really dislike making dresses. and why is it your favorite? JH: I like the cage doll in the blue linen because she has elegance and simplicity all in one doll, and the face of angel, (To quote the gal who bought her). JH: Izannah Walker, and my mean old mom. I have a doll makers spirit and that will never change! JH: I am not much of a reader, i have too much energy to sit and read. BUT i do so Love my The Doll by Fox. JH: Take your time. Do what you love, and Love what you do!! I have to remind myself all the time, "Its ok to be Itty Bitty". An Artist's Journey will be a Maida Today staple for the future featuring interviews with artists. People come at doll making through many paths. 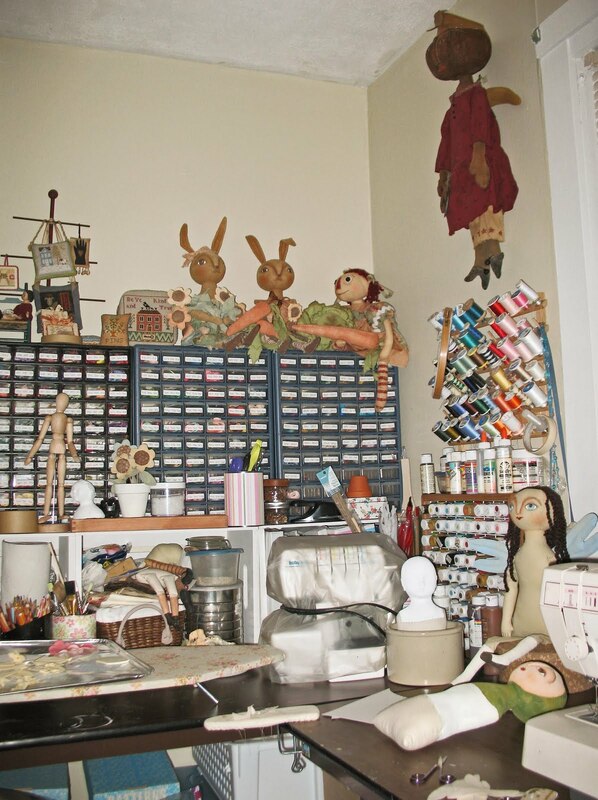 Some people discover dollmaking as an extension of sculpting. 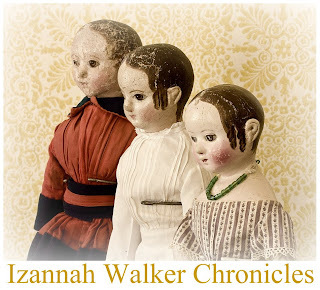 Others come to dollmaking through a love of all things old, and not being able to afford all the Izannah Walker dolls they'd like to have. ;-) And still others discover dollmaking as an extension of another craft - quilting or rughooking, for example. As an artist and doll maker, I enjoy reading about other artists, their work and how they came to be a doll maker. I have several doll makers in mind already. But if you have suggestions of people you'd like to read about, please email me. 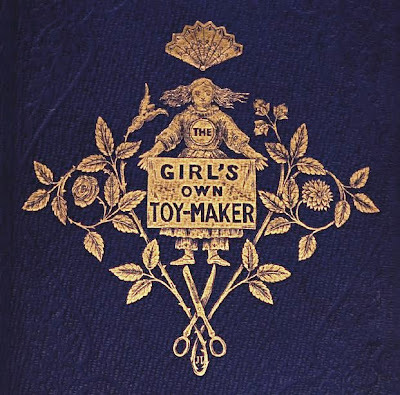 While browsing through Google Books I found this lovely book called The Girls' Own Toy-maker, which was written by E. Landells and his daughter Alice Landells, published in 1860. The book is filled with things that a girl could make with her own hands using cloth, paper and cardboard. 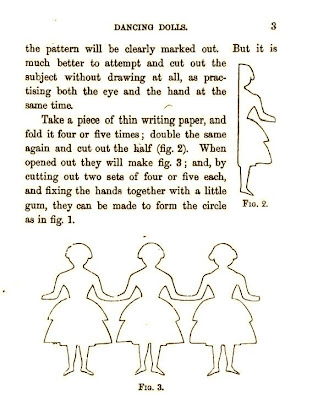 Below are instructions for making a circle of "Dancing Dolls", which would be lovely as a paper silhouette taped around the glass for a large hurricane glass with a candle in it. But there's more that will interest Maida Today readers. 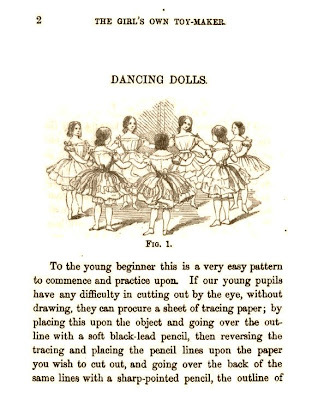 Pages 58-77 gives detailed instructions for "How to Dress a Doll." Here are some of the wonderful pictures taken from that section of the book. Other parts of the book have detailed instructions for making doll furniture and doll houses from cardboard. These designs could be easily translated to balsa wood for making an antique inspired doll house. which is in public domain. Truth be told as a child I liked dolls well enough, but I was more into playing role playing games with the neighborhood kids - usually a version of "Pioneer" where we met with disaster of some kind of another and had to find a way out. 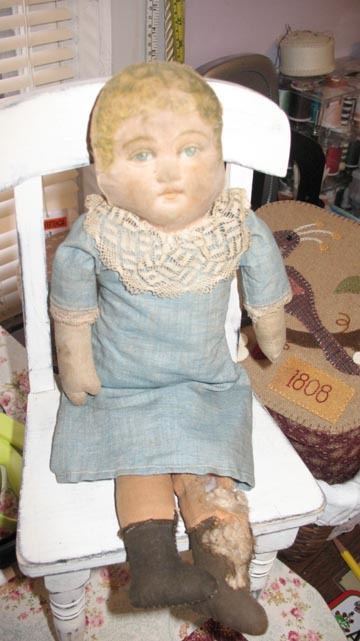 I fell into studying dolls as a result of loving old things first. The texture of age invites me into the story of the doll. Her round chunkiness speaks to me. paired these two dolls together. yet the sculpted hair gives it a textural interest. Doll heads without bodies were made and sold by the millions and millions from the mid 19th Century until well into the 20th. 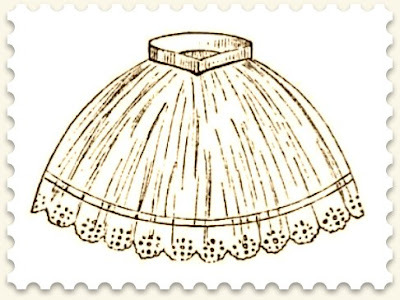 Some of these were later mounted on commercially made bodies sold separately, or on bodies which had suffered the loss of a head through breakage. But the most charming outcome was often a body made by loving hands at home, and looked it. A twill weave cotton was a popular choice of fabrics. 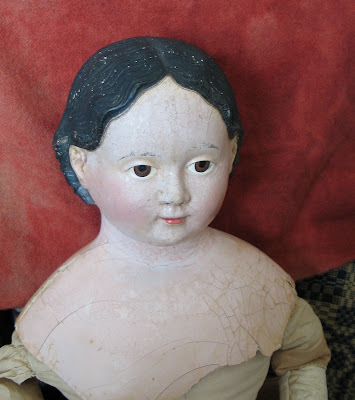 One example with a home made body is this doll with a blond Greiner head having an 1858 label, no extension. She is such a pleasant chunky little person, and delights me. 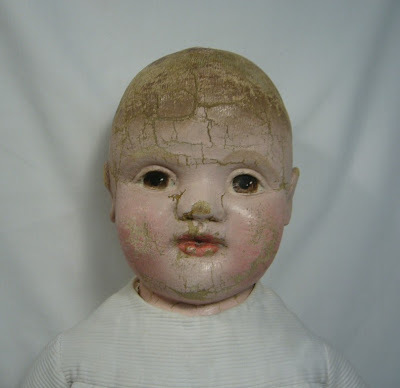 She came to me as a doll with a good bit of facial damage, but has responded well to my efforts to remedy that. I have a nice dress started for her of a civil war reproduction print in brown. Her arms end just rounded off to serve her as hands. The torso is made in 4 parts, and included the thighs in front on that same piece. 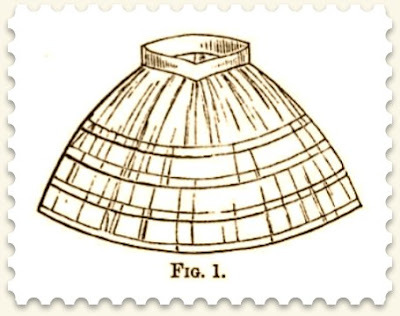 The handsewn body has a nice fanny shaped with pleating at the sides. 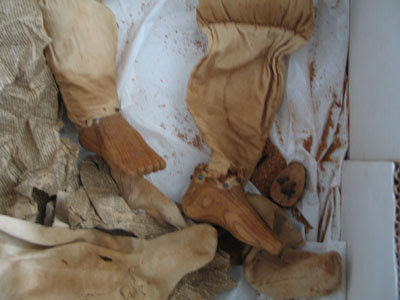 The bottom parts of the legs are the usual 2 part pattern including feet. In short the body is an often seen very well made pattern for a doll, but one has to wonder why the hands were left so primitive? 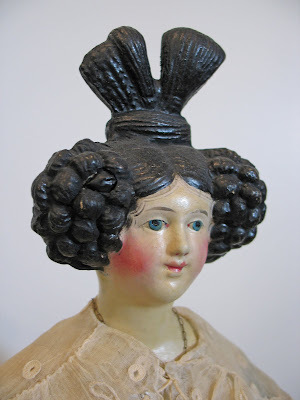 A glass eyed doll head made by Andreas Voit in approximately 1850 has a hairdo collectors call “covered Wagon” style. The maker of her entirely handsewn body went at it in a no nonsense lets get this done way. The body is made with the upper thighs, the torso and the ARMS made all in one pattern shape, a front and a back cut alike. 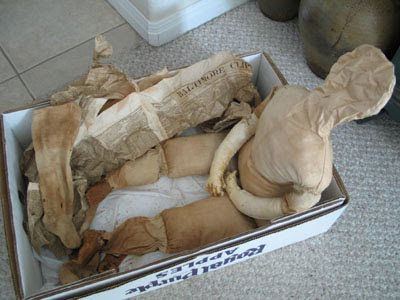 I feel that the leather arms and hands must have been added by someone along the time line of the doll, as they are well shaped and sewn and do not fit the old arms well at the joining. This type of arm did not provide much mobility, and a terrible tear in the front chest resulted in the cotton stuffing pouring out. I put a large patch in this place. So a one piece front and a one piece back plus lower legs were likely all that was done for this early pretty doll, 27 inches tall. She came to me with the head in many pieces, crushed beneath something in an attic long ago. I have rebuilt the head, far from perfectly, but she smiles at me now and I smile back, who has more than that? The illusion of life in her bright little black eyes could not be extinguished. 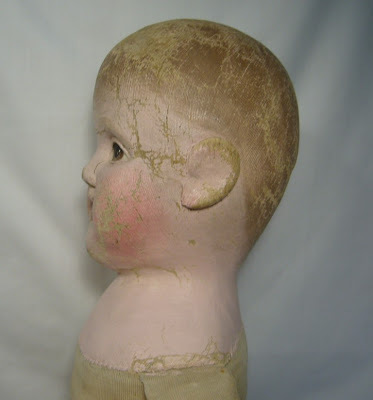 And then there is the body of the 10 inch papier mache doll head pictured fully dressed. The stained and limp old body she came with was leaking sawdust all over so could not very well be left as it was. The question was to patch it, or recover it, or replace it with something clean and sturdy. The large paper mache head was on this body with ragged clothing and very tightly fitting old shoes. I began by taking off the sox, very holey, but charming. Inside the sox, the otherwise rag body has carved wooden feet! The feet are held on with tiny tacks, which DH said may be as old as mid 19th century. They are beautifully done, with distinct toes, not the least primitive. Were they made for this doll body? My husband thinks maybe so. Were they part of another doll or artist figure or creche figure? I would guess that. They have never been painted. It is amazing how closely the old shoes fit. 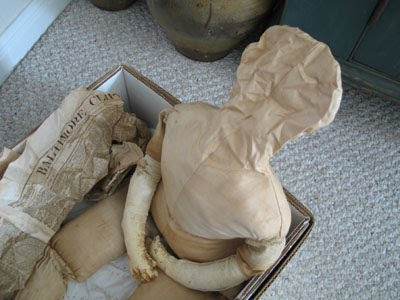 I carefully eased the head off the body, using the handle of a spoon to push against the fabric under the shoulder, and NOT against the fragile papier mache. The head has a patch inside the back curls. The top of the body was a surprise! There, made in the same piece with no seam at the neck, was a head shape! There was no face or indication it was ever used as a head, just wadded up and stuffed in the neck. 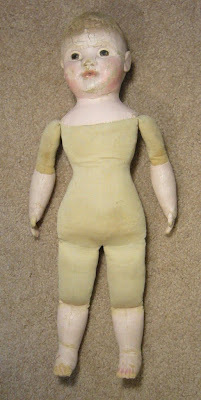 Why did the doll maker put a cloth head on the doll body? The entire old head and body is hand stitched, with back stitching for strength. 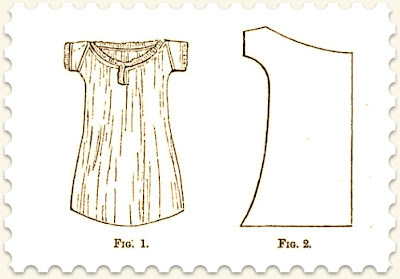 The torso is cotton twill, the legs and upper arms smooth old cotton. The worn out leather hands, much patched, are lately attached with white thread unlike any other on the body, obviously not original or even with her a long time. Now to the stuffing! Some parts were stuffed with sawdust. I opened a seam here and there and removed that, stuffed cotton gently and not too tightly in place, and sewed the seams back together. Some parts were stuffed with cotton, I did not bother those. The top of the body had a great deal of wadded up newspaper, the Baltimore Clipper of 1860. Reading all those notices in that is fascinating! One notice is about the Mount Vernon ladies society purchasing Mt Vernon from a Washington descendant. Along with the sawdust of a lower leg was a wad I think says 1861. I debated what to do with the doll's interesting extra personality! I pictured it in an email to friend Helen, who said I should call the old cloth doll “Inner Self”. I made a fresh body for the papier mache head and dressed it in a nice old dress I bought for her. 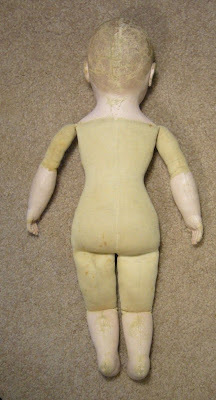 I can keep the old body, feet showing and head lightly stuffed and set it around naked with the rest of the dolls. It seems too interesting to cover up. The newspaper is in a plastic sheet cover to protect it and help flatten it. There is a name inside the papier mache head in pencil, not really old writing, “Ruth Hancock” I believe. Maybe this is the person who mended the curls in back. Or it could be the name of the original owner. 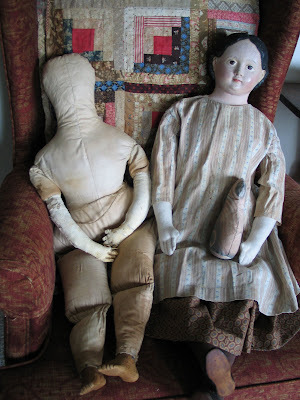 This great 36 inch doll often sits beside her alter ego, Inner Self. When I first started making dolls almost a doll maker gave me a list of books to get that would be good to study. At that point I'd never heard of Izannah Walker! So how do you make an antique inspired doll? Well, first you study antique dolls. 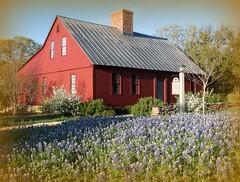 Going to museums and antique doll shops is helpful so you can see them in the round. But reading books and looking at pictures can give you a wealth of information. You can check them out of the library before buying through inter-library loan here in the United States.. Once you know you want to own a book Amazon is a great place to find them used. Sometimes books will show up on Ebay for pennies, so it's good to do a search for doll making books there, too. Cloth Dolls from Ancient to Modern - Linda Edward - Excellent book! A must have. 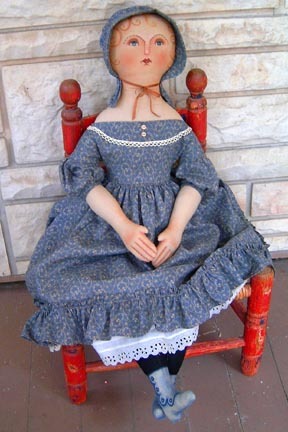 American Folk Dolls - Wendy Lavitt - another must have! The Doll by Carl Fox - an older out of print huge book with lots of information. 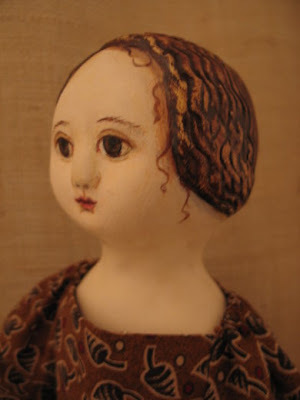 Wonderful Dolls of Papier Mache - Gerken - an older book with very few color pictures but the information is outstanding. 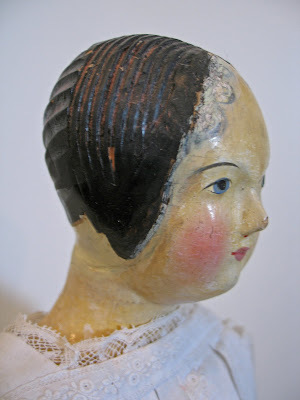 German Papier-Mache Dolls 1760-1860 - Christiane Grafnitz - Wonderful book! Now out of print but not hard to find on Ebay or Amazon. If you look on Amazon for Papier Mache Puppen it's essentially the same book with a different ISBN number. The Collector's Book of Dolls' Clothes: Costumes in Miniature 1700-1929 - Dorothy S., Elizabeth A. and Evelyn J. Coleman....out of print and pricy but a great resource to have. Keep a watch on Ebay and Amazon. 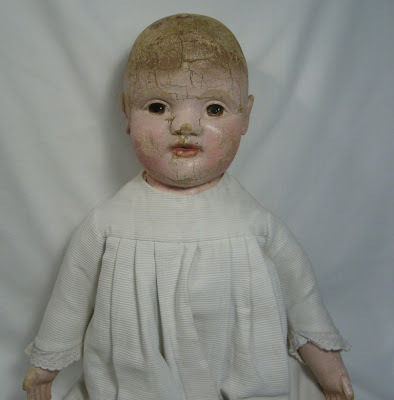 Another way to learn about antique dolls is by attending the University of Google. Take the time to really, really look. 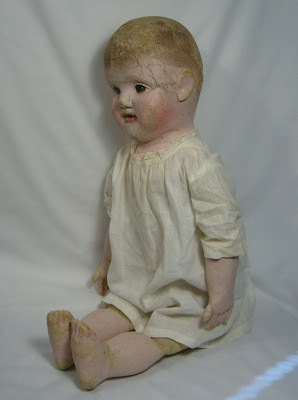 Also, check out what's for sale on Ruby Lane and Ebay in the antique doll sections. Visit doll shops like Carmel Doll Shop which have online catalogs. Read other people's blogs...often they're sharing about what they're learning. 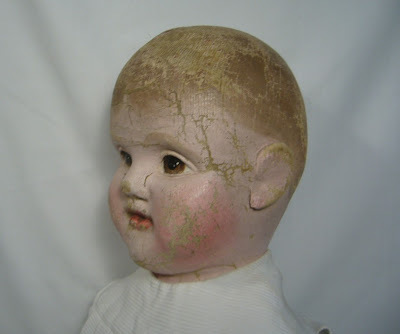 Last week I emailed Joan & Lynette Antique Dolls and Accessories to ask if I could post pictures of the Philadelphia Baby in their Ruby Lane shop. They said yes, and here are the pictures provided by them. Isn't that a sweet baby face above? "Philadelphia or Shepherd babies were made in Philadelphia, Pennsylvania in 1900. 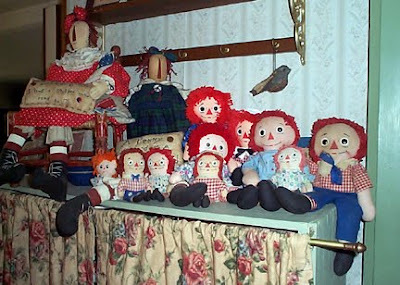 These dolls were sold in the infant's departement of the J. B. Sheppard & Co. store which was in business from 1860 to 1935. 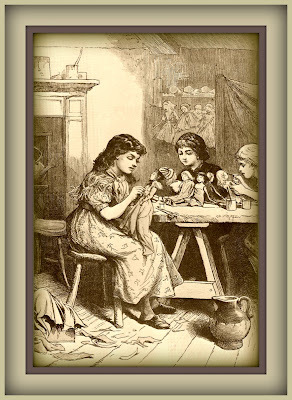 It is known that the dolls were costumed by skilled needle workers in Sheppard's own workshop but whether the dolls themselves were made there or elsewhere remains a mystery. 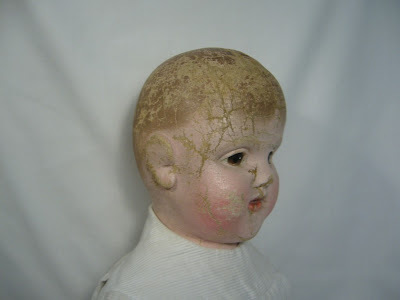 Philadelphia babies measure 18 to 22 inches (45.5 to 56 cm) and have a molded stockinette face with a vertical seam running up the back of the head. The faces are well modeled with deeply incised eyelids. The bodies are also stockinette with the lower arms, lower legs, shoulderplate and head being oil painted. Examples have been found with both light and dark hair colors with the eyes done in blue or brown. There are sewn joints at the shoulders, hips and knees. 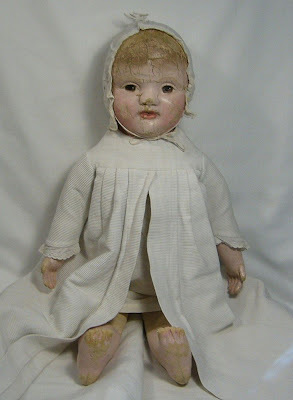 When found on the dolls, the original clothes usually consist of a long baby gown and bonnet." The simple applied ear is appealing. would be perfect for a child to hold. Thanks to Joan & Lynette Antique Dolls and Accessories for allowing us to have a peek at this great cloth baby doll through their pictures!